Though establishment Republican leaders and the mainstream press–without any evidence–incessantly claim Republicans must cave on immigration enforcement to appeal to Hispanics, a majority of Hispanics actually want Congress to pass legislation making it tougher for businesses to illegally hire illegal immigrants. Revealing that Americans realize illegal immigration makes it tougher for them to find good-paying jobs, a Paragon Insights poll found that Americans across all ethnicities, income and age groups, and political affiliations supported stronger rules that make it tougher for businesses to employ illegal immigrants. Americans in general, by a 50-point margin, wanted tougher rules against hiring illegal immigrants, and that included a majority of Hispanics (56% to 37%). Respondents were asked, “Would you support or oppose Congress passing new legislation that strengthen the rules making it illegal for businesses in the U.S. to hire illegal immigrants?” The question unified all groups such as Democrats (58%), Obama voters (58%), Republicans (90%), Romney voters (90%), Hispanics (56%), African-Americans (55%), Protestants (78%), Catholics (75%), Evangelicals (76%), non-Christians (63%), and those in urban (66%), suburban (72%), and rural (73%) areas. Americans employed in the private sector (76%) and the government (63%) also wanted tighter rules against hiring illegal immigrants in addition to white-collar (72%), blue-collar (72%) and female voters (67% to 22). It is worth noting that white-collar employees, especially those in the high-tech sector, would be impacted by potential increases in guest-worker visas, which tech industry executives have coveted for decades even though there is a surplus of American high-tech workers. And illegal immigrants who receive temporary work permits would be eligible for government employment. The poll also found that a majority of Americans oppose President Barack Obama’s executive amnesty and want Congress to defund it. The survey found that 58% of Americans oppose Obama’s executive amnesty while 53% of Americans want it defunded. Only 36% of Americans support Obama’s executive amnesty and 36% oppose defunding efforts. The poll also found blue-collar voters in particular strongly oppose Obama’s executive amnesty–62% of blue-collar voters oppose it while only 32% support. In addition, blue-collar voters “strongly” oppose Obama’s executive amnesty by a 3-to-1 margin (47% to 15%) over those who strongly support the measure, which is consistent with the near 3-to-1 opposition (43% to 16%) among those making $50,000 to $100,000. In addition, nearly a third of Obama voters oppose his executive amnesty while independent women, by a nearly 5-to-1 margin, strongly oppose rather than strongly support Obama’s executive amnesty. The Paragon Insights poll, which was conducted January 22-25 and has a margin of error of 2.5 percentage points, reveals that Americans across the board would like more lawmakers in Congress to hear their voices on illegal immigration and Obama’s executive amnesty. See? Why would stupid politicians believe that Americans of "hispanic descent" would feel any differently about the ravages of illegal immigration than any other American? Sure, there may be some brainwashing they've been subjected to, sure, there are all those phony 501 C 3 tax fraud "charities" pushing the opposite of what Americans want and need and many of them are entitled "Hispanic" or "Mexican" or "Latino" something or other, but these orgies don't represent or speak for Americans, whether of Hispanic descent or something else, they are tax payer funded lobbying organizations for the foreign cartels behind this travesty and not representative of America or Americans at all, they are the complete opposite. Thank you so much for doing this poll and reporting the results. It confirms what I and so many other Americans already knew. Real Americans are Real Americans, regardless of national origin. So I hope the goof balls roaming around the Republican Party seeking the "Latino" vote by selling out our nation wise up to this fact and the regulars who know better do the right thing and stop this immigration madness, because it's pure insanity and self-destructive to our nation and citizens. Last edited by Judy; 01-27-2015 at 10:59 PM. Just another example to me that the media and politicians should quit separating us into groups as often as they do. Just ask 'American citizens' the questions in their polls, shouldn't matter if they are white, black, hispanic or pink with purple polka dots. Mayday, artclam, Judy and 1 others like this. Exactly. I totally agree with you, Jean! Great point. You're welcome Judy. You also make many many excellent comments and points all over our forum. light and Mayday like this. I'm Hispanic, I proud to be American citizen. Last edited by light; 01-28-2015 at 01:48 AM. Judy, Mayday, Jean and 1 others like this. I'm proud of my Hispanic heritage, but I don't support illegal immigration. Last edited by light; 01-28-2015 at 01:45 AM. Judy, Mayday and Jean like this. Oh thank you so much, Jean. We all make a great team, and WE ARE going to win this war. This has been showing up in polls for, I think, at least the last two years. Maybe longer. IMO Hispanic Americans know that their children and grandchildren will be hurt by illegals - just like the children and grandchildren of all other Americans. With workforce participation down, wages stagnant, and even our STEM graduates having difficulty getting jobs in their fields, we actually don't need any immigration at all. None, zero, zip. What we do need is Universal E-Verify. I think that NumbersUSA still has a free fax sending service and that a call for Universal E-Verify is one of the faxes which people can send to their elected representatives. ALIPAC and Judy like this. Please let me know if any of you spot anymore like this that are strong arguments for our side of the debate! 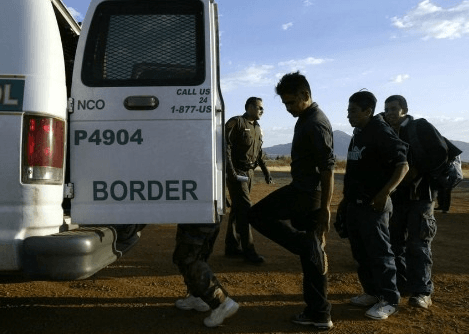 New Laws Suspend Licenses of Businesses Hiring Illegals!